Will the old pavement not be the only thing gone from Jenifer Street after reconstruction is finished? Any traveler on Willy Street, be it by foot, bicycle or horseless carriage, knows it just takes more time to negotiate the heavily utilized thoroughfare; choked with traffic that barely makes it to the posted speed limit except during rush hours. Conversely, the traffic flows much more freely on Jenifer Street, a street that once held trolley cars. Now devoid of stop signs for six blocks, it is a veritable expressway that holds bicycles, buses and transient cars that try to escape Willy and their own speed control. Traffic on Jenifer is too darn fast, it has always been over the last four decades of my own existence living on or nearby. 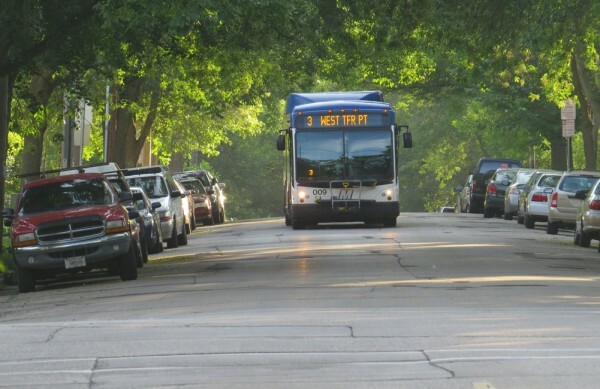 But the reconstruction is bringing about a rare opportunity to test a thought neighbors have been having for years: Moving the bus routes to Williamson. 1380 Williamson Street is slowly evolving into Gib’s, a swanky waiting area for the space-challenged Grampa’s Pizzeria next door. Not even a year after Grampa’s Pizzeria opened they had a problem, a very good problem. Most nights, especially the weekends, there was nary a table to be had. The approximately 45 seat restaurant serves a staple of four to five well thought-out pizza offerings along with inventive sides that change with the seasons or the creative whims of Co-Owner and Executive Chef Gilbert Altschul. 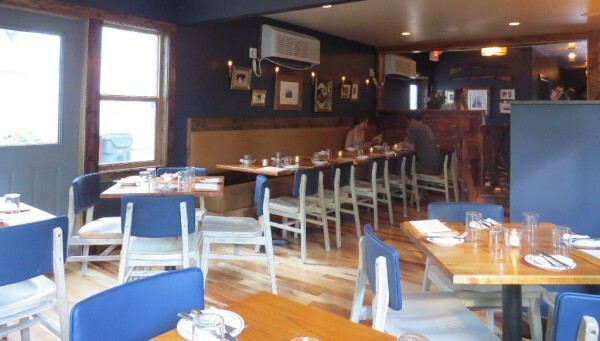 The small location also has its cozy charm but very little space for patrons who are waiting to be seated. Earlier this year Altschul partnered with notable cocktail creator Hastings Cameron and Grampa’s bar manager Josh Swentzel to open Imaginary Bar next door at 1380 Williamson Street to provide a loungey “waiting room” experience for diners. As the project moved forward the restoration work became quite extensive and pricey causing Altschul to buyout Swentzel and Cameron. The two-story bar has been renamed Gib’s Bar but will retain much of the original intent, however Altschul is energized by the new project including culinary inspiration from such things as salmon in a cone. Former MNA President Scott Thornton addresses the 2012 meeting. 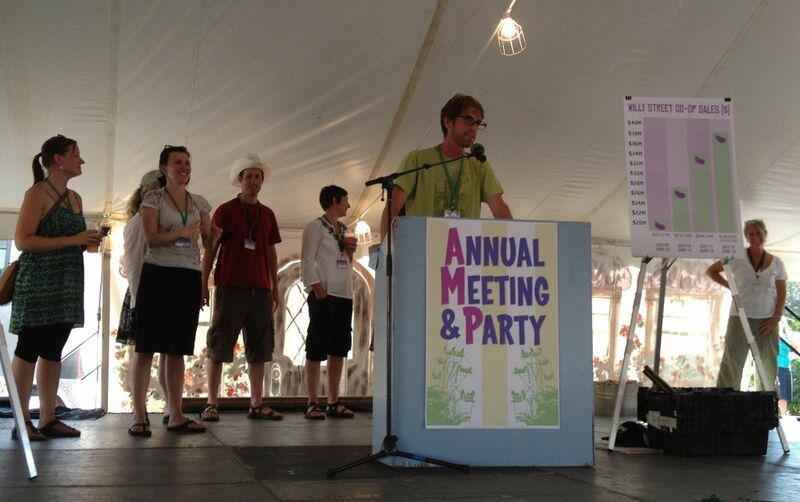 MNA has seen a resurgence in membership recently and is strong advocate within the city. 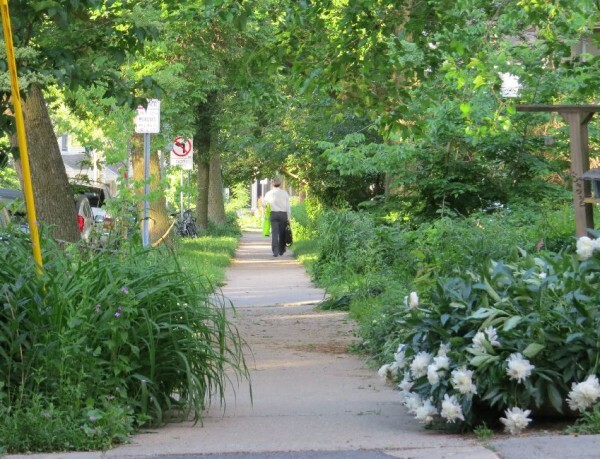 In the same month that the Marquette Neighborhood was honored for being one of the greatest places to live in America, partly due to the strong engagement by its residents, a key meeting this week by its association may play a role in the shape of the neighborhood for years to come. 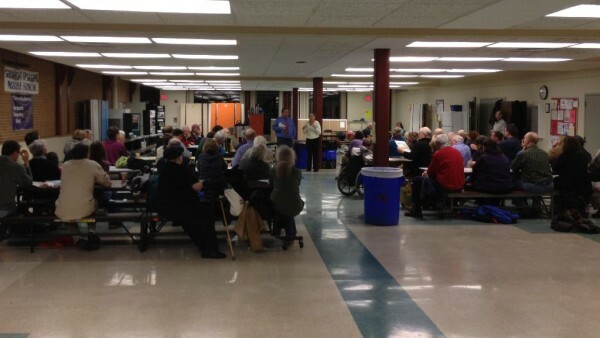 The Marquette Neighborhood Association will hold its annual Membership Meeting Thursday October 17, 6 p.m. in the Marquette Elementary School cafeteria. Most years this meeting is a time for the MNA Board to present an overview of the past year and the one ahead, elect new officers, consider initiatives, collect membership dues, and approve the budget. This year seems to carry special weight as several contentious issues in the areas of development, festivals, and how the Board itself conducts business and fills vacancies have bubbled up among the members. The jammed packed agenda was deemed so critical that guest speaker Wisconsin State Representative Chris Taylor was asked to move her appearance to the November meeting to accommodate the proceedings. 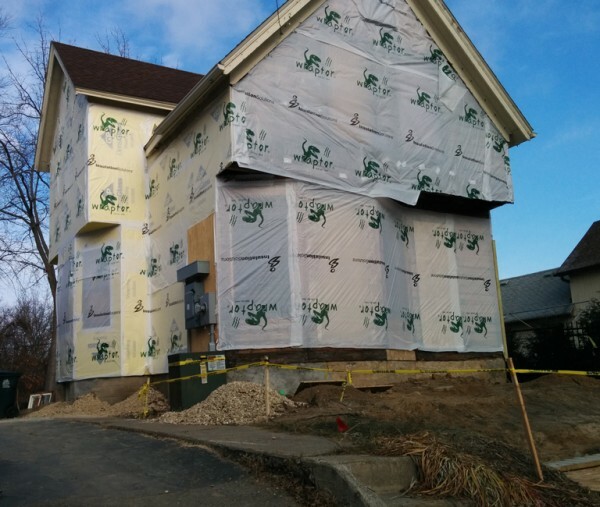 Earlier this month the Williamson-Marquette Neighborhood was recognized as a Top 10 Great Neighborhood in the United States. The honor, presented by the American Planning Association, is ratification of the intense involvement by neighborhood residents both longtime and new to create a truly unique and rewarding place to live. Citing walkability, strong revitalization efforts following decades of decline, and strong community engagement, the APA‘s Larry Ward presented the award to the neighborhood and was joined by Soglin, District 6 Alder Marsha Rumel and Marquette Neighborhood Association representatives Lindsey Lee and David Mollenhoff. In the late 1960s and early 1970s the Marquette neighborhood, dilapitdated in some areas and bound by an aging industrial corridor, was threatened by various uneven development schemes including a freeway through the rail corridor. The MNA was formed in 1968 in part to combat these encroachments and created its first neighborhood plan in 1971. The plan and the engagement of community members who took the risk to live and build the neighborhood to what it is today, is why the APA is recognizing what we have already known for some time: This is a great place to live. Have you got time for one last summer festival? The Willy Street Fair will straddle the Autumnal Equinox this year with sunny and 65 predicted for Saturday September 21 and Sunday September 22, the first day of fall. The fair is a major fundraiser for Common Wealth Development and the Wil-Mar Neighborhood Center. Common Wealth Development and the neighborhood at large have gotten pretty good at putting on this event. The food and retail vendors are more numerous, the music stages highly coordinated and more spophisticated, but the inclusive soul of the neighborhood still shines through. 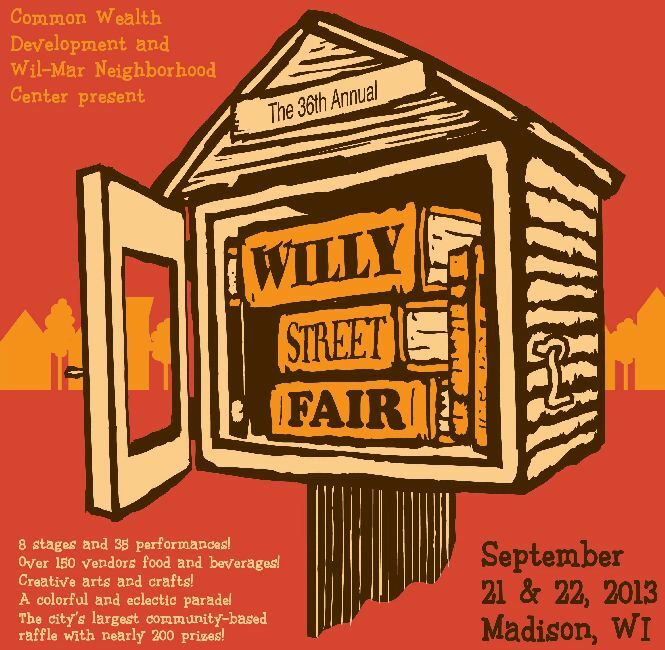 Maybe its just me who has noticed this but, now fair Saturday is named as “The Willy St. Warm-up” and the actual fair is Sunday. Don’t be confused by these marketing semantics, there will be music, fun, dancing, and food each day, all day. Luv Joy Seamon (center) and two other Cycropia performers during the opening act of Circus Quercus on Family Night at the Orton Park Festival, August, 22, 2013. Several thousand people, most of them families, gathered under the grand oak next to the Orton Park gazebo to watch Cycropia’s salute to the trees of the park and the modern circus movement with their performance of Circus Quercus. Crycropia uses various rings, trapezes, and custom-made metal apparatuses adorned with colorful silks and suspended from trees in their performances. Thursday (August 22) was a veritable mid-summer night’s dream as theater-style lighting allowed the performers to fade in and out of the darkness like one had happened upon playful forest creatures in a clearing on a glorious summer evening. Anders Osborne during last year’s Orton Park Festival. 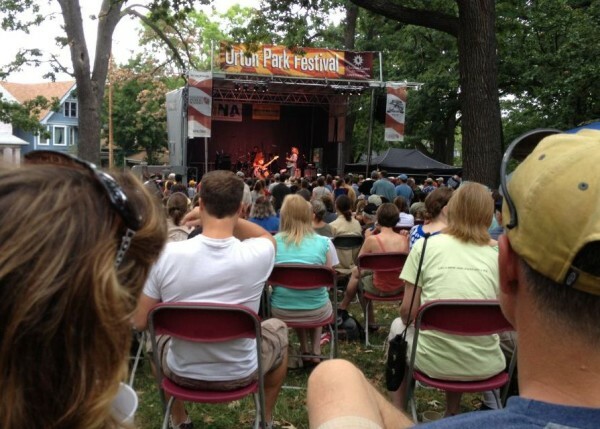 For the forty-eighth time the Marquette Neighborhood and all their friends from beyond will gather under the stately oaks of Orton Park for the festival that bears its name and is emblematic of the people who live here. 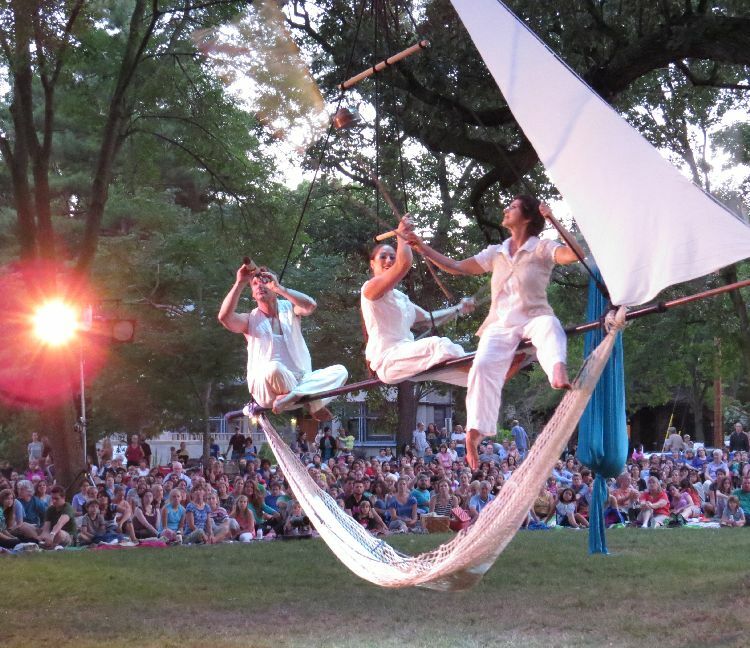 The Festival, which is put on by the Marquette Neighborhood Association, runs from Thursday through Sunday (August 22-25) featuring an aerial dance troupe, cake walk, auction, and three days of live music from local, regional and touring bands. From the outside the festival will not be much different from past years, however behind the scenes there has been a reshuffling of responsibilities as longtime director Bob Queen retired last year from his leadership role. Taking over the helm is MNA Vice President Ralph Kuehn who cut his teeth in event organizing through his membership in the Madison Home Brewers and Tasters Guild and their annual event The Great Taste of the Midwest. The intimate table setting in Grampa’s main dining area was too close for one patron who complained about a breastfeeding diner. Last week at Grampa’s Pizzeria, Managing Partner Marissa Johnson offered a breastfeeding patron a more private area to nurse after another patron had complained. According to an account published on Madison.com the patron did not accept the offer and left soon after. 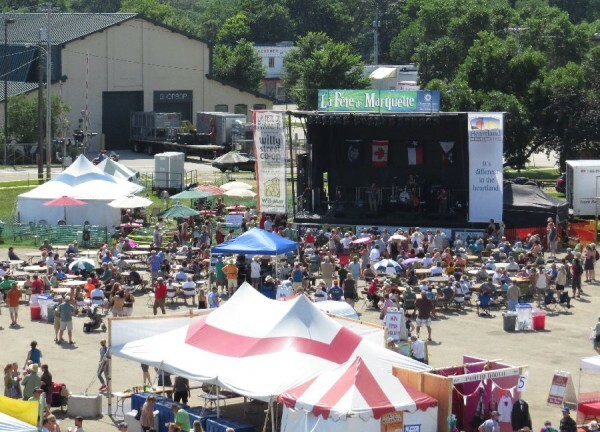 A view from the Big Wheel of La Fete de Marquette, Saturday July 13, 2013. 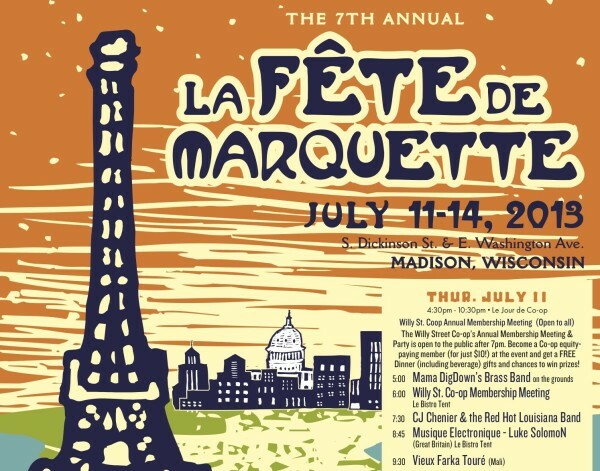 La Fete de Marquette benefited from glorious weather this weekend with sunny skies and highs in the 80s. The sun splashed French music and culture festival to benefit Wil-Mar Neighborhood Center overcame the slightly uncomfortable temperatures at times to provide foot-stomping music both on the main stage and underneath the big tent. 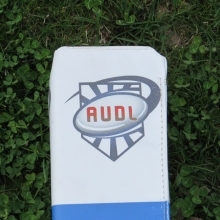 Its been called one of the best music festivals in the City of Madison. Even the New Orleans musicians invited north to play the event say it outclasses many gatherings in the Crescent City. For the Marquette neighborhood its just good fun for a good cause.